Did you notice my new awesome blog design? Ashton from Something Swanky not only creates original and drool worthy desserts...she also creates custom blog designs. Ashton took my vision and made it come to life at a very affordable price. I just LOVE opening up my blog every morning and seeing the cheerful colors and polka dots! You can see more examples of Ashton's custom blog designs here under the Design Gallery on the right side bar. Go visit Something Swanky's Etsy Shop to get started! I'm working on creating a visual recipe index, but for now, you can find recipes by browsing the categories on the right or using the search box. There's a new "Printer Friendly" button at the end of each post where you can choose to remove the images and delete my ramblings so you are left with just the recipe to print. 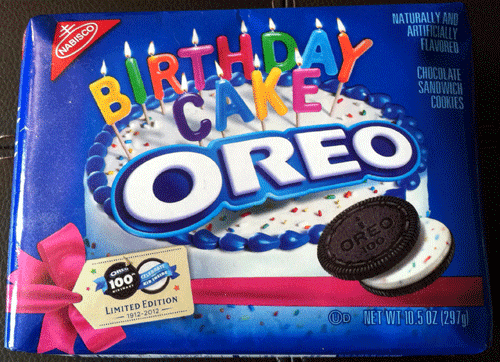 Now...let's talk about the Birthday Cake Oreo Cookies! Aren't they pretty? I walked into Super Target for my weekly grocery and household shopping, and I saw these on the front aisle of good snack food. 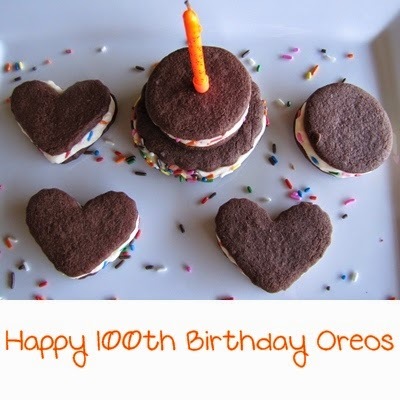 Oreo is celebrating 100 years of the best cookie ever with these Birthday Cake Oreos. I've made moist Homemade Oreos before using cake mix, but this homemade version is from scratch using a chocolate cookie recipe from My Kitchen Addicition. I created the filling that tastes like birthday cake by adding cake mix and french vanilla creamer to homemade buttercream frosting. The chocolate cookies are not very sweet on their own, but when combined with the filling, they are amazing! In a large stand mixer bowl, cream together the butter and sugar until light and fluffy. Add the egg and vanilla and beat until combined. In a separate bowl, whisk together the flour, cocoa powder, baking powder, and salt. Add to the wet ingredients and mix just until combined. Divide the dough in half, shape into disks, and wrap in plastic wrap. Refrigerate for 1 hour. After the dough has chilled, preheat the oven to 350 degrees. Line two baking sheets with parchment paper. Take one disk of cookie dough and roll out on lightly floured work surface to about 1/4 inch thickness. Cut into desired shapes and place on prepared cookie sheets. Bake for 12 minutes, then transfer to wire rack to cool completely. In a large stand mixer bowl, cream together the butter, shortening, and vanilla until smooth. Add the sifted cake mix and powdered sugar. Slowly turn on the mixer and add the creamer. Add more creamer if needed to make thick frosting. Add the sprinkles and mix just until incorporated throughout. 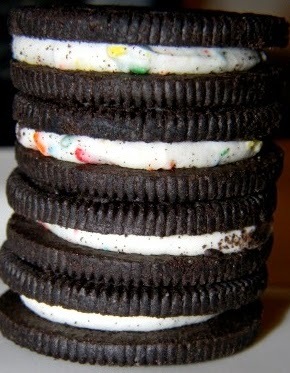 Assemble the cookies by piping a thick layer of frosting on the bottom of a cookie and placing another cookie on top. You can add more sprinkles to the sides of frosting by hand or by rolling into sprinkles. Enjoy! Be sure to grab a new button too! The html code is on my right sidebar. Everything looks great Rhondi! Love the new design and love, love the filling ingredients! Thanks for the shout out! And the Oreos look SPECTACULAR! I love the new design! Ashton is so awesome. And these cookies look yummy! I don't know what's more gorgeous - the design or the cake!! both are sensational! OK, these cookies sound perfect and I can just picture them this summer with ice cream in the middle too! You blog makeover is beautiful, so cheerful and easy to read, love it! Love your new changes! And these homemade oreos look yummy! Looks delish! Love the new blog design! Thanks for sharing over at Weekend Potluck! These are so cute! I have been afraid to try the Birthday Oreos thinking they would be too sweet, but I bet homemade ones are perfect! And so pretty! Your Oreo's cookies look great! Omgosh these look so good!! I can't wait til I can eat junk food again so I can try these, too! This is perfect for my niece's 7th birthday. I want to try it know. I'm currently looking for acatering business in suffolk county to help me out with niece's surprise birthday party. I'll be handling them this post.